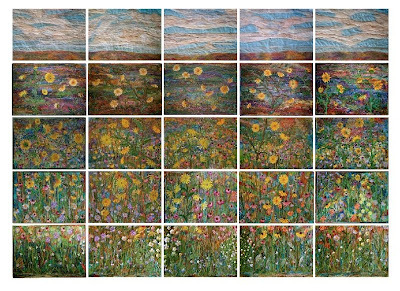 Featuring just a blossom or two was my initial plan for these 20 mini quilts that measure 8"x 10". 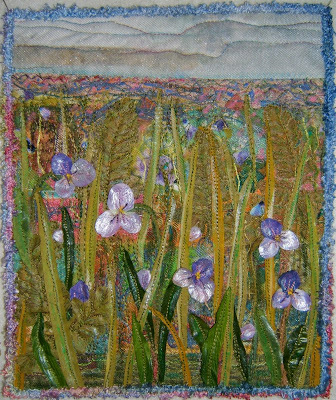 All the Violets leftover from those I made for "Prairie Performance" made it into this one . I consider it's a "bug's eye-view" perspective. 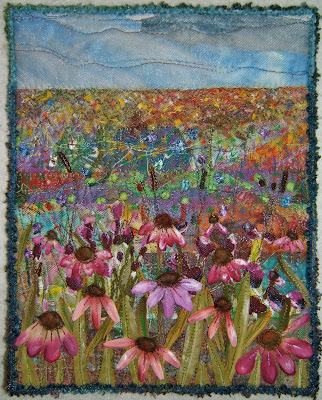 The scale of flowers that I chose for the first two mini's featured in my last post dictated big patches of Daisies and Cone Flowers in the foreground. They started out with just a few blossoms. More ... and more ... were added to each until they looked "right". My not knowing how each small quilt is going to turn out is what keeps me from getting bored ... the biggest factor that ensures all 20 will get finished. Of course, you've spotted Elvis hiding in the backgrounds of the 2 new ones. I found a project. 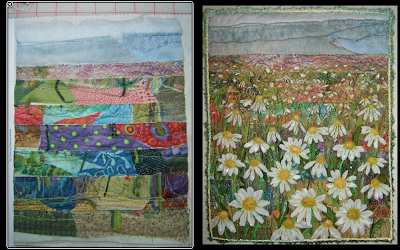 Making mini quilts that feature prairie flowers. 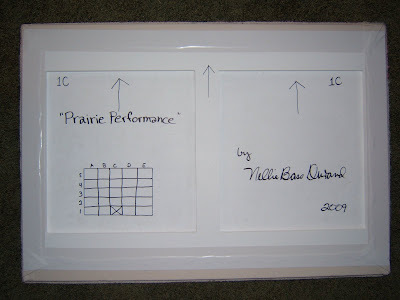 I figured that I might as well do this while all the supplies from making "Prairie Performance" are not yet put away and I'm in the groove of working with them. It surprises me that I'm not sick to death of this theme. I guess those flowers are not yet out of my system. 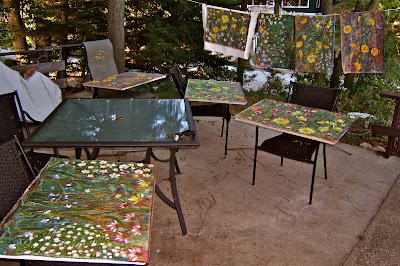 Their foundations are made from the pieces cut off the 25 panels when I squared and trimmed them to their finished size of 23"x 24". Whatever else would I do with those trimmings? At any rate, I just cannot discard them. Here are five sets laid out. The bottom one's strips are sewn together with a zig-zag stitch. And here's the stack of twenty foundations cut from those stripped together pieces. The first one I made features daisies. I was disappointed this favorite flower of mine was not indigenous to the prairies of northern Illinois. Consequently, there are none in the installation piece. I'm making these as thank you gifts for my friends who've contributed scraps that most likely ended up in the BIG prairie flower quilt. 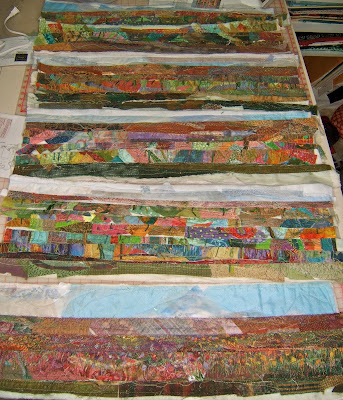 I think they'll appreciate having these small quilts made of scraps and leftovers from "Prairie Performance". 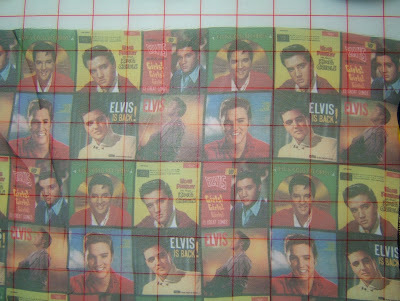 As you recall, Elvis was tucked in a number of places on the big quilt. 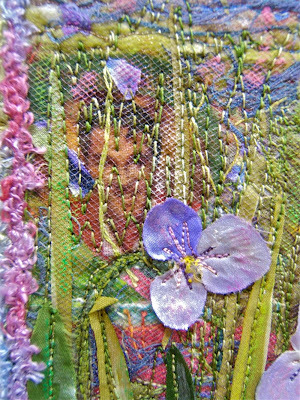 Each of the mini ones will have an Elvis cut from this chiffon scarf hiding among the flowers. Here's one. Can you find the other in the field of daisies? 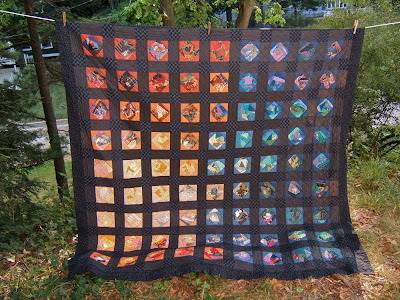 This wall quilt, "Courage" was created in 1997 for a young friend as a graduating from college present. This quote by Anais Nin is embroidered in a spiral in the center, " Life shrinks or expands in proportion to ones courage." 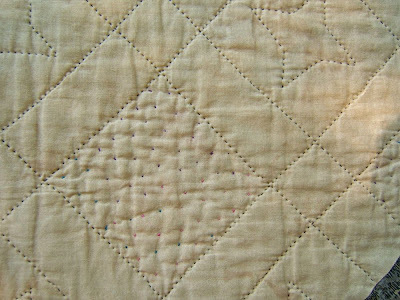 The periods of clinical depression experienced on and off for a number of years by my friend are represented by the frayed raw seams on the front surface of the quilt. The joy and positive adventures I hoped she'd find are portrayed by the sparkling jewel-like colors in the outer portions of the connected rings. For the most part, I think her adventures in life so far have been in the outer ring. It's hand quilted. 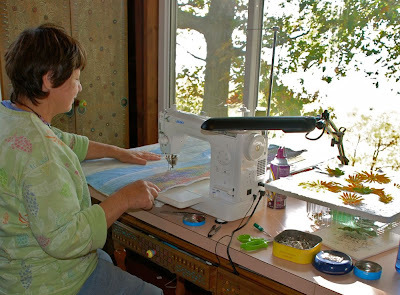 This photo makes me miss those days of sitting in pleasant, quiet places stitching for hours. Here's a photo of the backside. 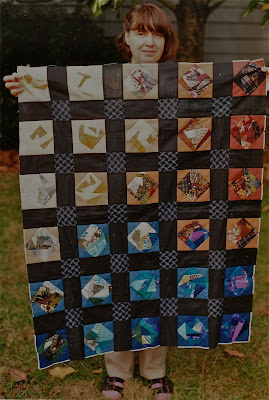 The last post as well of this one feature quilts made in my early days of quilting. This happened because I had to move the binders in which I keep the information about the quilts I've made. 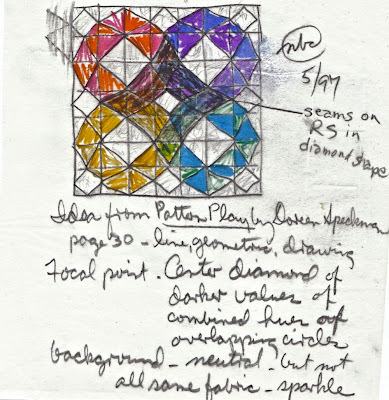 Pocket pages hold the drawings, templates, photos, and info that pertains to the creation and finishing of each quilt. 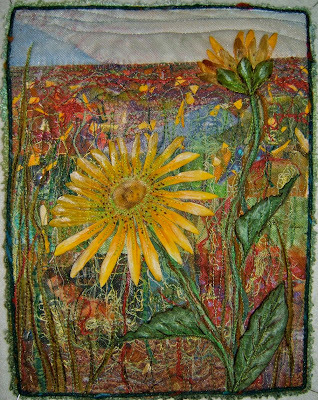 I scanned the drawings and photos of this quilt on my computer to get the photos here on my blog. 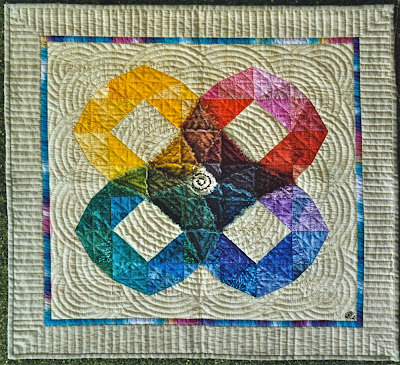 I had forgotten this was inspired by Doreen Speckman's "Peaky and Spike" pattern that I saw her present on "Simply Quilts". Can't recall if I bought her book or checked it out from our guild's library. Here's a photo of my design wall that shows fabrics being auditioned. I still work this way ... making a loose sketch that's not too detailed filled in with general hues and values and then working the details out on the design wall. This method of designing is more dynamic than planning every detail and making all the decisions on paper. The time or two when I have done ALL the planning ahead, the projects never got made ...for me, the adventure of creation was done by then. Pulling out those binders happened at a good time. 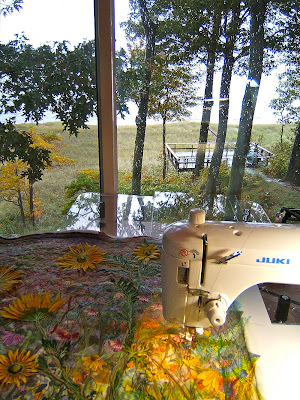 I feel as though I'm "on hold" after the completion of the prairie flower quilt ... that I need to take time for contemplation. 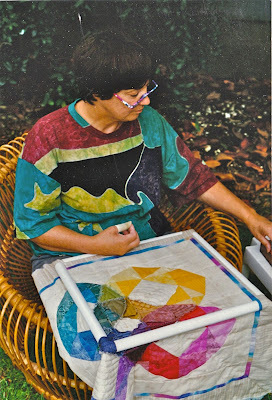 While they are out, stay tuned for the presentation of more quilts from the early days of my adventure into quilting. 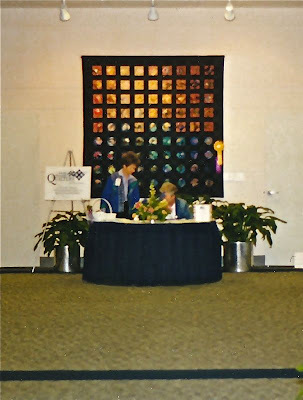 This quilt, "Secret Windows", spotlighted the Smoky Mountain Quilt Guild Show at the 1998 Dogwood Arts Festival. My husband and friends protested it being given away. 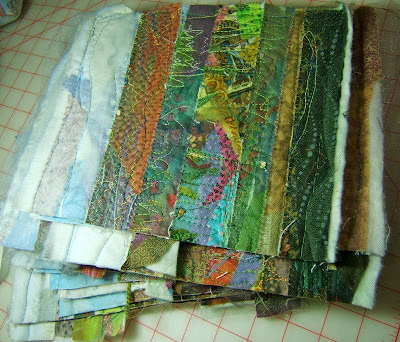 So, through the next few years I'd occasionally make more crazy quilt squares from my own scraps. 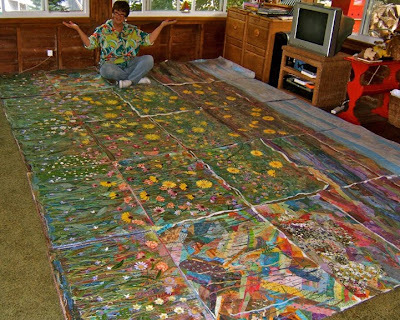 It grew into a full-size quilt that ended up being a Christmas present for our younger son and his wife. It still looks good all these years later as you can see in a photo taken this summer. 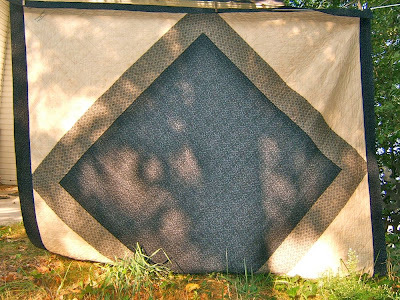 I like to piece the backs of quilts. 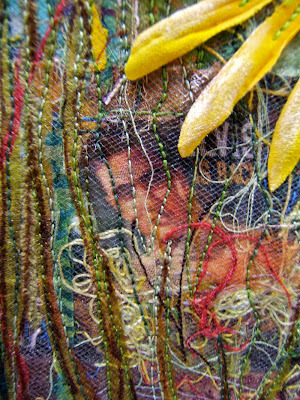 The hand quilting is more easily viewed from the backside. 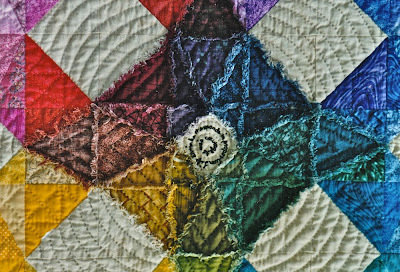 The crazy quilt squares set on point are quilted with satin-stitches using two strands of variegated floss. 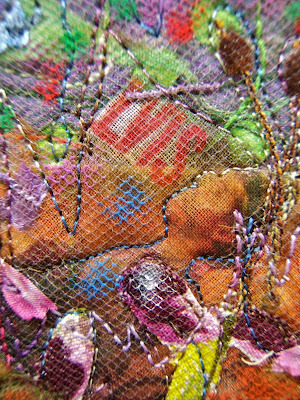 There was no way I was going to hand-quilt a running stitch across all those seams. 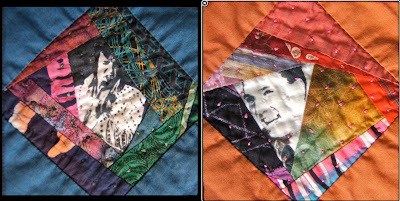 The portraits were cut from a shirt sewn by my mother-in-law for my husband with fabric featuring artists from the Expressionist period. It was a great shirt for the 1970's ... worn with chains at the open collar plus a wide belt with a big buckle and platform shoes. Woo Hoo! Let's do the Hustle. 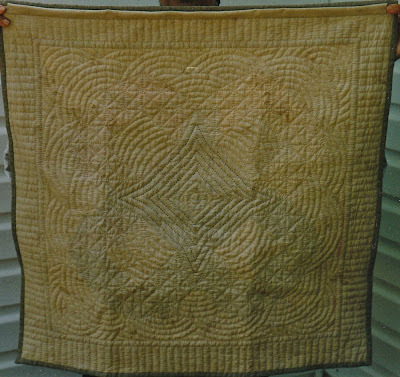 This is the first quilt in which Elvis made an appearance. 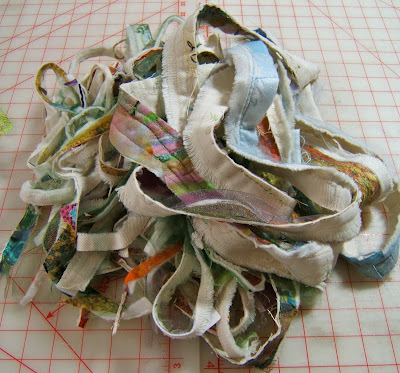 I still have some of the home decorator fabric that was cut apart for the triangles around the crazy quilt squares. 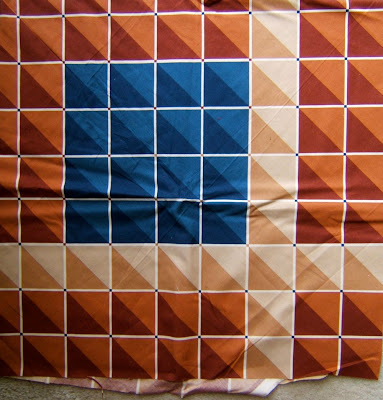 The printed squares are two and half inches. 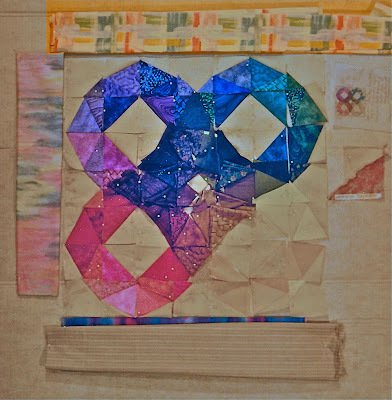 Maybe I'll make another window quilt with crazy quilted blocks from the many bags of scraps collected in the ten years since this quilt was begun. 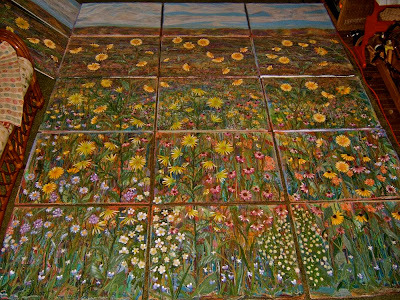 The prairie flower installation piece is FINISHED! Woo Hoo!!!! The twenty-five panels are packed up and ready to be delivered. That's 250 pounds of artwork!!! 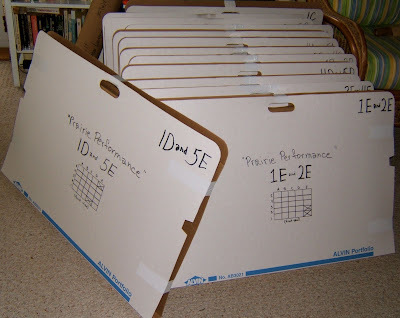 Each panel is mounted on a piece of MDF board that weighs 10 pounds. 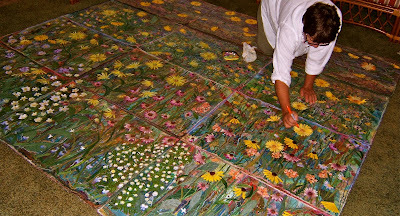 This is the most could be laid out at one time on the living room floor to see how the flowers looked across the separate panels. I've been frustrated with not actually being able to see all it together at one time. Plus, the perspective of looking at it on the floor from a standing position is akin to my laying on the floor to look at art hanging on the wall ... not a normal perspective at all. 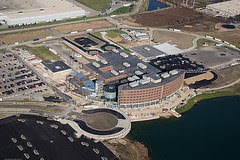 I can hardly wait to see it installed on the wall in the lobby of the new Sherman Hospital in Elgin, Illinois at the grand opening on December, 15th. There's no shining sun outside my window ... out there it's cold, windy, and raining. The only sunshine to be found is in my field of prairie flowers. 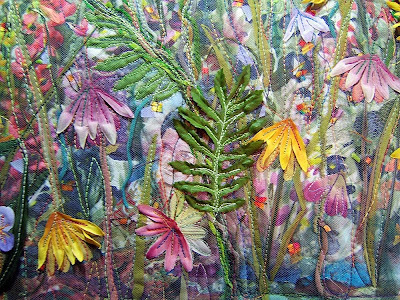 This is the second to last of the twenty-five panels to get its detail layer of blossoms, leaves, etc. Just one more to go and this step is finally finished. The next part of the finishing process is to lay out the two rows down the right side to give those 10 panels the highlights and blending with the pastels, markers, and paint. This panel was the last chance to hide Elvis's image among foliage. The last one yet to be worked is more or less a haze of flowers ... this picture would be too obvious there. Well, back to work so we can get out of this summer cottage that is not meant to be occupied this late in the season.